Prototype: 2 Austrian Federal Railways (ÖBB) class 1043 electric locomotives. One version in the Valousek design and one version in the classic Sweden design. The locomotives look as they did around 2001. Model: Both locomotives have mfx digital decoders and a locomotive whistle sound. They also have controlled, high-efficiency propulsion. 2 axles powered. Traction tires. The headlights will work in conventional operation and can be controlled digitally. Length over the buffers for each locomotive 18 cm / 7-1/8. 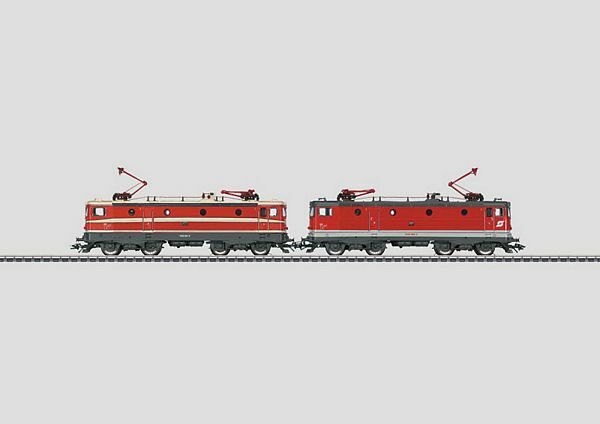 Double motive power for prototypical Alpine operations. Freight cars to go with these locomotives can be found in the display under item no. 00799.